London and books and cats, oh my! Imagine combining three of my favorite things in the whole world into a novel: London, books and cats. You'd think you'd be on to a winner, wouldn't you? 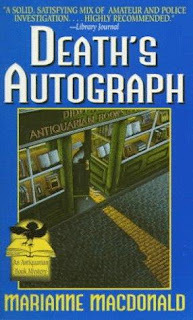 All those elements come together, not entirely successfully, in the novel Death's Autograph by Marianne MacDonald. The story concerns antiquarian bookseller Dido Hoare (one of the worst names ever in fiction) who scrapes by in her shop in London. She is divorced from her con-man husband Davey but is kept company by her cat, Mr. Spock. She also pays frequent visits to her father Barnabas, a retired Oxford professor. Things are going along as usual when one evening, Dido is startled when she notices a car following her. Not long afterward, the slimy Davey makes an appearance and attempts to worm his way back into her life and her shop. Before long, Davey and another of Dido's acquaintances end up dead, and Dido feels she is the key to the crimes. She just has no idea what the connection could be. A hunky policeman named Paul Grant appears on the scene and gets more involved with the situation than is strictly warranted. There follows a great deal of rushing back and forth, worrying about her elderly father, and, most annoyingly of all, a lot of ignoring the advice of the police (and common sense) in putting herself in danger. There's also one situation that is blatantly obvious as it's happening, but it only occurs later on to Dido -- and you can tell the reader was supposed to be amazed and impressed when "all is revealed." The book had the potential to be interesting, but the characters and "big mystery" just weren't all that engaging. Add to that the bizarre assertion that the term "rent boy" is of American origin (don't ask), and you're just left with a muddle of a book. This is the first in a series of 7 books, so they must improve over time. Lisa, I'm envious of your love of fiction. I just can't seem to manage it. I'm too much of an information junkie. If it's not history book or a bio it won't keep my interest. Just the cover of that book and the premise as you say looks interesting. Too bad it didn't live up to its potential.